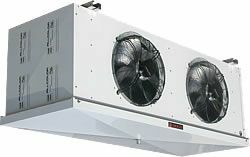 Commercial air coolers for small and medium cold rooms or storage goods fresh surgelata. Special copper tube Ø 12,5 mm. Fin spacing 4,2 - 7 mm. Single Phase 220/240V-50Hz in conformity with VDE. Working field +50 / -40 ° C.